You probably noticed signs like this one at properties along Wilmington Pike. 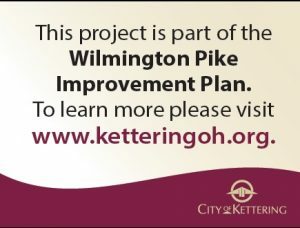 The signs identify properties that are being revitalized using the Wilmington Pike Façade Improvement and Demolition Programs. The Façade & Site Improvement Program is available for exterior building façade or site improvements that encourage economic development activities. The property at 3600 Wilmington Pike was completed as a part of this program in 2015. We continue to aggressively pursue private developers and commercial property owners to invest in the Wilmington Pike corridor and our efforts are paying off.